Bahubali god is one of the most honorable lord among the Jains. He was the son of Adinath. He is the Jain deity and statue is located in Shravanabelagola in Karnataka state of India. It is a 57 feet high statue of Gommateshwara Bahubali. It was built in 981 AD from a single piece of rock. Shravanabelagola is one of the most sacred Jain place and many pilgrims came here to pay the visit. Mahamasthakabhisheka of Bahubali is happening after a duration of 12 years. Lack of devotees will gather here to watch the Mahamasthakabhisheka of god Bahubali in Shravanabelagola, Karnataka. Festival already started on 7th February 2018. President of India Ram Nath Kovind has inaugurated Mahamastakabhisheka festival. Mahamastakabhisheka festival dates are 17 February 2018 to 26 February 2018. Festival starting time is 2 PM on February 17 and end date is 26 February. Thousand of pilgrims will reach this small village of Karnataka to attend this holy festival. NRI Day is 21 February 2018. Registrations are required for Kalash allotment. A entry fee is required for Kalsah and donation amounts depends on the number of people and type of registration. NRI needs to register in advance and a silver kalash will be allotted after the successful payment. Addition Rajat Kalash cost in hundred dollars (100 USD). Details are found here. Shravanabelagola is located in the Hasan district of Karnataka. It’s a small village famous for the deity of Bahubali. It is 80 KM far from Mysore city and 150 KM from Bangalore city of Karnataka. Below is the map of Shravanabelagola showing the location of the village. Shravanabelagola is a small village and a small railway station is located in this village named as Shravanabelagola Railway station and station code is SBGA. Very few trains halts and crosses from here. By Air: Mysore and Bangalore are the nearest airport to Shravanabelagola. Mysore has limited flight connectivity, whereas Bangalore international airport has good connectivity from all major cities of India and World. Rest of journey of 150 KM can be covered in 3 hours via cabs and other modes of Road Transport. By Train: Railways are another mode of transport to reach here and Mysore, Hassan and Bangalore are the nearest railway station, which provides good connectivity from all the parts of the country. Few passenger trains are halted at Shravanabelagola railway station. Details of Shravanabelagola train can be found here. By Road: Shravanabelagola village has good roads. During the Mahamastakabhisheka festival many buses and other modes of transport will be running for this route especially for the convenience of devotees. Air is the best mode to reach the Shravanabelagola, flight till Bangalore take 2.5 hours time and the rest of the journey can be covered via road in 3 hours. Trains are another option to reach here and the rest of the journey can be covered through road and passenger trains. The preparation of the Mahamastakabhisheka already started and below are the main highlights of this grand event. Mahamastakabhisheka will be done on an large area of 400 acres. 5 crore rupees of Compensation given to farmers. More than 10 crore rupees spent in the preparation of stage which is made by German technique. 500 crore rupees expected to be spent on this whole event. 12 temporary cities have been setup for pilgrims and devotees. Shravanabelagola committee has made the arrangements for the stay of 20 thousand devotees. 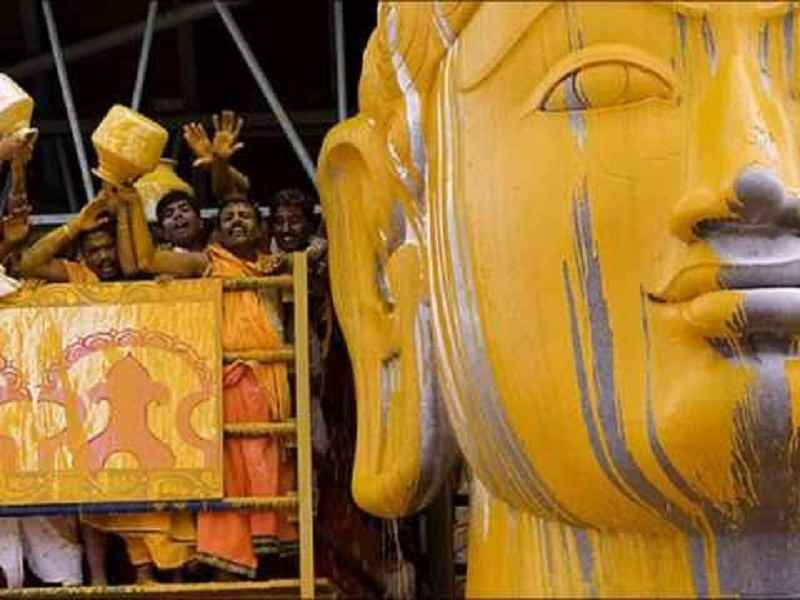 50 Lakhs (5 Million) people expected to take part in Shravanabelagola Mahamastakabhisheka. Security of this premises in the hands of more than 7000 police. It is a grand event and it should be visited by every Jain devotees as it happens after a gap of every 12 years. We gather the information of Bahubali Shravanabelagola Mahamastakabhisheka from various sources for our readers.